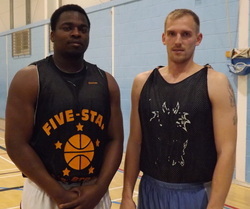 Bradford Dragons Basketball Club are pleased to announce the re-signing of Vance Silcott and Rihards Šulcs. Silcott, who originates from the West Indies, is the clubs longest serving player, now entering his seventh season with the club. He has been a key ingredient in the Dragons’ success, as they gained promotions from English Basketball League division 3, through division 2 and into division 1, in successive seasons. Latvian forward, Šulcs, is also a long serving player for the Dragons, this being his sixth season with the Bradford club. He both a tough and fast player, who works hard for the ball and is a high flier, with a spectacular slam-dunk finish. Dragons tip off their 2014/15 season this weekend, with a home ‘double-header’ against Manchester Magic, on Saturday (6:15pm), in the National Trophy, followed by a National Cup first round fixture against Sefton Stars, on Sunday afternoon (4:15pm). Both games will be held at the Bradford College Sports Hall, Trinity Road, Bradford.